With Christmas right around the corner you may be giving your budget a look over for some extra spending cash. While it’s always a great idea to look for ways to save, it can be equally as helpful to look for ways to earn. Last year I shared 23 Ways to Earn Extra Money for Christmas which are all still relevant now. Today I wanted to dig a little further on the very easiest way to come up with some extra Christmas money – selling your old stuff! Selling your old stuff can kill two birds with one stone. First you get the benefits of extra money and secondly you get rid of your clutter. Not to mention, out of all the ways to earn extra money selling what you already have requires the least amount of effort. Ready to get started? 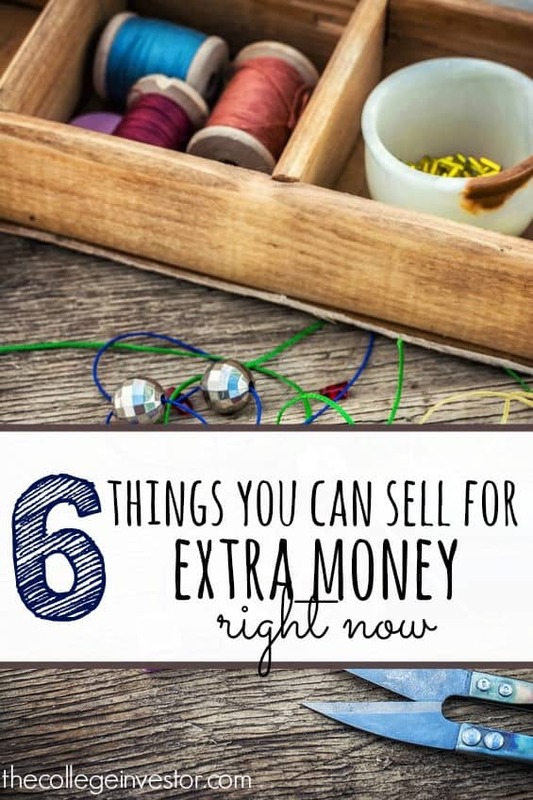 Here are six things you can sell to earn extra money right now. If you have a pile of college textbooks sitting around you may be able to earn a small fortune. But that’s only if you act fast! With college textbooks it’s best to sell them as soon as you are finished with them and before the next version of the books comes out. Cash4Books.net – Simply enter in your book’s ISBN number, get a quote, send your books in with a prepaid label and receive a check or PayPal payment when the books are received. BookScouter – BookScouter is a textbook buyback comparison tool. With BookScouter you’ll type in your book’s ISBN number and they’ll check with 42 different places that buy back books. From there you can select the best offer. Powell’s – You can get an online quote for your fiction books through Powell’s. If you like the quote you can send in your book via prepaid shipping and after inspecting your book Powell’s will credit your account or pay you through Paypal. They are very particular about the condition of the books they accept. Amazon – There are a lot of things you can sell through Amazon’s Trade-In program including books. Just type in your ISBN number and get an offer. If you like the offer send in your items and Amazon will credit your account after receiving the books. Clothing is another item that many people have an excess of. Facebook Yard Sales – Facebook Yardsales can be a great way to quickly get rid of your items. If you haven’t already, join your town or county’s yard sale or garage sale page and list your items. ThredUp – ThredUp is an online consignment shop that accepts women’s and kid’s clothing. You can request a closet cleanout bag from ThredUp and after you send in your items they’ll make you an offer. You can receive an account credit or PayPal cash for the items they accept. eBay – eBay is one of the best places to sell designer items. If you have high end clothing or accessories that are in good shape give eBay a try. If you’ve recently redecorated or just have too much furniture sitting around, sell what you don’t need. Furniture, especially if in great condition, can be your big ticket item earning you the extra cash you need in one swoop. Craigslist – There are tons of people who browse Craigslist on a daily basis looking for the perfect items for their home. This makes Craigslist one of the best places to sell used furniture. Facebook Yard Sales – If you’re like me and don’t have a Craigslist city close to you then Facebook Yard Sales is a good place to list furniture. As much as I wish I was crafty enough to make items to sell, I’m just not. If you are the crafty type of person you can earn extra money selling your creations or even turn your skill into a full-fledged business. Right now is a great time to try your hand at selling your crafts since many people (myself included) like to support small business owners during Christmas. Etsy – Etsy is one of my favorite places to shop and is the biggest craft marketplace online. There are no membership fees to sell on Etsy. You do have to pay $0.20 to list an item and then a 3.5% transaction fee when the item sells plus a 3% payment processing fee. Shop Handmade – Shop Handmade is a completely fee free marketplace to sell your crafts. Do you upgrade your electronics often? If your answer is yes and you have a pile of smartphones, tablets or laptops lying around you can cash those in. Gazelle: This site accepts a variety of smartphones, IPads, Mac Books and Mac Computers. Visit the site, enter in the specifics of your device and you’ll receive an offer. If you’re happy with the offer you can send in your item for free and receive a check, Amazon gift card or PayPal payment. Amazon Trade-In: Amazon allows you to trade in a number of different electronics. Simply visit Amazon Trade-In and enter in the product information of the electronic you’re wanting to get rid of. Amazon will give you an estimate. If you’re happy with the estimate you send in your item. After Amazon reviews the item you sent in they will credit your account with an Amazon gift card. We’ve all gotten gift cards at one point or another that we’re never going to use. If you’re like me you still have a couple sitting around from last Christmas. Cash them in! Selling gift cards is an extremely easy way to earn money because you don’t have to wait for them to sell. Simply visit a site like CardPool enter in your card and value and you can instantly see how much money you get from it. 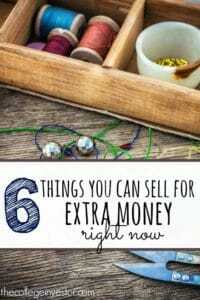 Selling items you have laying around is truly one of the best ways to earn extra money fast. However, if you’re sold out and are still looking for ways to earn be sure to check out 23 Ways to Earn Money for Christmas and 50+ Ways to Make Money Side Hustling for more great ideas. What are your favorite things to sell to make money fast? Some great links in this post that I didn’t know of before! Definitely keeping this post handy with Christmas just around the corner.